In the midst of heated battle, Ed, Envy and Prince Lin of Xing are swallowed whole by the homunculus Gluttony. When they finally escape, they find themselves face-to-face with the "father" of the homunculi, who offers Lin immortality as the new Greed. Meanwhile, Colonel Mustang learns the military's corruption goes all the way to the top, and the truth of what really happened in the Ishbalan War is revealed. 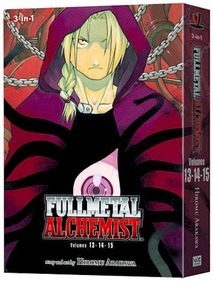 Collects volumes 13-15 in an omnibus edition.